I found this image on Reddit the other day under the Cord Cutter’s thread. It was by a Comcast user who is being charged for their internet usage. I was a little alarmed at this, but not totally so. Awhile back when I was logged in to my Comcast account, I saw a little interactive box in the corner of the dashboard that told me how much data I had used for the month. It took me by surprise because it reminded me of what the cell phone providers do. “Are the internet providers going to follow suit?” I thought. While they are “suspending” the enforcement of our data usage threshold, I’m sure it is only a matter of time. I know they are losing a lot of money through the millions of customers who are cutting their cable cords every day. I’m sure they aren’t too pleased about this and I’m sure they have something up their sleeve to make up the difference. If we can see from the Reddit image, Comcast has implemented a strategy for charging users for their usage. And, many customers from the thread indicated they were already being charged for their usage. I thought I’d do a little digging on this and find out what our friends at Comcast are up to. Huntsville and Mobile, Alabama; Tucson, Arizona; Fort Lauderdale, the Keys and Miami, Florida; Atlanta, Augusta and Savannah, Georgia; Central Kentucky; Maine; Jackson and Tupelo, Mississippi; Knoxville, Memphis and Nashville, Tennessee; and Charleston, South Carolina. Is this just the beginning of data usage charges? I don’t think that Comcast is the only provider who is going to go this route. With so many jumping on the Internet streaming bandwagon and gobbling up data with their usage, I think this is the start of a new way for providers to generate revenue. Like I mentioned before, they don’t like losing money (and cable is a very lucrative structure for them), they will find a way to make it up. Data usage charges is the beginning. While we haven’t come very close to using our “250 GB” threshold – I’m sure it will be more likely with more online streaming. And, when they do start enforcing the threshold like they are doing in other areas of the country, I’m sure it won’t be pretty. Are you being charged for your internet data usage? What do you think about where all this is headed and what might be other options for us? Update 10/27/15: Recent StarTribune article about Comcast testing out the option to charge customers for their internet usage as the growth picks up. Update 10/13/16: Almost a year ago to the date of this article, we received notice that Xfinity would begin limiting the data we are allowed to stream every month. Their profits are getting eaten up and they aren’t too happy with all those who have jumped ship from cable use. This is one way to combat that. 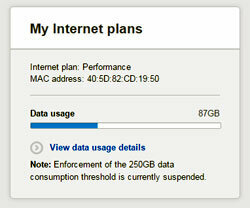 While the limit is high at this moment (1TB) – I’m sure they will begin clamping down in the future. It’s interesting to see how companies respond to market changes. In Australia we have Netflix which is kind of similar, and many are bypassing Foxtel (our cable provider) to go for net-based program providers instead. Suddenlink does the monitoring. If you go over repeatedly, you have to upgrade to the next plan tier. My parents used to say something about free lunch. I think this applies. I’m also a Comcast user (no choice right now); about two years ago they sent out emails talking about how much data usage we’d be allowed per month. Not an issue for me; I’m always pretty well below what we are allotted, but for some people I know it is a challenge to stay within the bounds. What I hate about Comcast is that where I live, they require you to have cable TV if you want internet at faster than a snail’s pace. Google fiber will be in my area soon (just got an email from them saying they will be getting things going within the next few months), and I can’t wait to dump Comcast. From what I have heard Google fiber isn’t inexpensive, but the quality is vastly better, and I can have internet without TV. I’m interested to learn more about Google Fiber too – that could be a great competitor to other providers. Competition should drive prices down..